Google is making good on a promise it made previously to the Android Wear community today, officially opening up watchface creation to third-party developers, complete with new tools, and a dedicated section of the Google Play app marketplace. 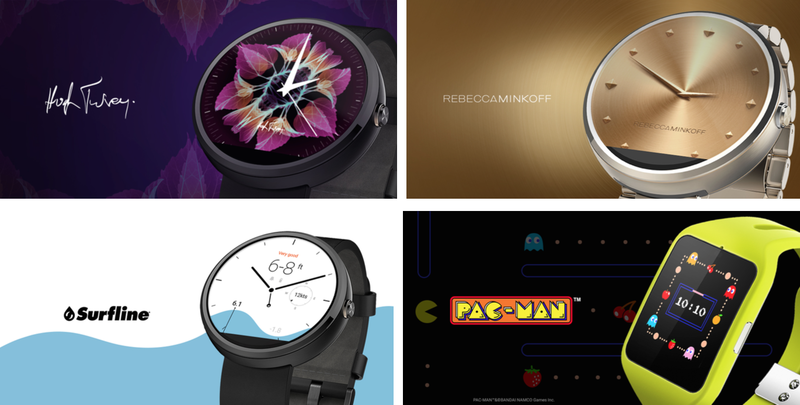 The launch includes a collection of officially sanctioned watchface apps from high-profile artists, brands and other partners, including Hugh Turvey, Porsche, Pac Man, Red Bull, Despicable Me, Rebecca Minkoff and more. I have to admit, I wasn’t expecting Google to launch this with a branding push, but it makes perfect sense, especially given Apple’s decision to feature a Disney watchface so prominently in its launch event unveiling the wearable. While watchfaces have recently sparked some legal action from high-end watchmakers looking to stem the tide of copycats selling their brands for a quick buck, the ability to turn these into a monetization or advertising opportunity for companies could prove a decent new commercialization option for mobile software, so long as the adoption of Android Wear hardware continues to grow. A brand new Android Wear companion app makes it easier to browse, download and swap out these new watchfaces, and of course the Watchface API is now available for developers to tinker with, so they can be sure they’re giving users the best software optimized for display dimming, power saving and more. In addition to the watchface additions, Android Wear gets some other improvements, too, including the ability to quickly recall cards you’ve dismissed, and prioritization of recent actions in the list that appears when you activate and then cancel voice input. A new quick settings tray is available with a simple down swipe from your watchface, too, and there’s a theater mode for making sure the screen stays off and no vibrations come through when you require it. Sunlight mode makes the screen a bit brighter in sunny conditions. What might be most important in this update for users who’ve complained about notification noise is that you can now block notifications from a specific app on the Android Wear watch itself, letting you filter out the noise while retaining notifications on your connected Android smartphone. Finally, you can carefully manage power and storage with granular looks at how much of each any application is using directly in the Android Wear app itself. This release will roll out gradually starting today, so keep an eye out for an update pending for your Wear device and Wear companion app soon.